Special needs parents and caregivers come up against the spectre of expectations on a daily basis, but the holidays can bring up even more challenges. 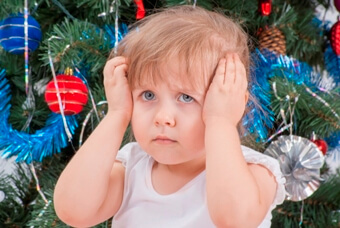 You may have your ideal holiday all planned out in your mind, or be burdened with visions of holidays past, but your child with special needs may be unable or unwilling to go along with the images in your head. This is certainly true to for typical kids and teens, too! While you may get comfort from attending some form of worship, to a person with special needs a church, temple or other holy place may seem scary. There are strange smells, loud sounds and crowds. This can all be too over stimulating for certain people. Some places of worship are starting to offer services geared to those with special needs, or may offer an alternative activity while the parents attend services. If these options are not available in your area, ask for them to be initiated – or help to start them yourself. Headphones, earplugs and even surgical masks may help with excessive sensory input. Weighted vests or special fidgets or stuffed animals may offer a sense of being grounded or calmness. Let’s say you open a present from Great Aunt Ethel. It is a sweater, and you don’t really like it, but you know that you should still say thank you. Some people with special needs lack that politeness filter and may blurt out their honest feelings, such as “that is an ugly sweater.” Not only is Great Aunt Ethel offended but the parents of the child with special needs may also come under fire for not teaching the child “good manners.” Too bad no one taught Great Aunt Ethel good taste, then this awkward situation would have been avoided. Maybe waiting to open gifts in private could help spare Great Aunt Ethel’s feelings, and of course a polite thank you note afterwards would be appreciated. Visiting friends and family can be challenging due to strange environments, new people and changes in routine. Bring familiar items and if necessary, favorite foods you know your child will eat. Social stories where you can rehearse acceptable responses are helpful, and de-sensitization practices may help make new places less problematic when you visit them beforehand while they are empty. Your holiday tradition may include a visit to Santa. As a former Macy’s Herald Square Elf I can tell you that as nice a person as Santa is, to a small child this giant man in a vibrant red suit can seem terrifying! Screams, crying and squirming are common responses even from neurotypical children. If your child with special needs truly can’t handle an encounter with Mr. Kringle please don’t force them – you are trying to make a happy memory for kids, not torture them. Check local malls or a We Rock The Spectrum location for Sensitive Santa, which is a crowd-free visit with subdued lighting and low or no music. Many special needs families have gotten their very first happy holiday photo thanks to these events. Waving to Santa from across the mall or a photo with Santa far in the background may also be a fun alternative to standing in a long line to meet him face to face. It isn’t just visiting the jolly elf that may bring up tough situations – Great Aunt Ethel may bring her own set of problems. At her house the rules may be different, which is difficult and possibly even upsetting for individuals with special needs. Even if she comes to your house she may upset the usual environment; she may wear a strong perfume or change the usual mealtimes. While you may want that photo of your child and Great Aunt Ethel snuggling by the fire, your child may want nothing to do with her. Give your child some space. A group photo may be more tolerable for your child. After some time your child may become comfortable with new people and new settings. Let them ease in at their own speed. Editor’s Note: Autism Speaks is a co-sponsor of Sensory-Friendly Santa. Click here to find one in your area.